Poly(methyl methacrylate), PMMA, or acrylic microspheres and spheres are spherical polymer beads that are a transparent thermoplastic synthesized from methyl methacrylate polymer. 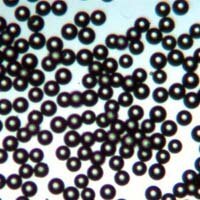 PMMA microbeads are known for high impact and heat resistance, and good tensile and flexural strength. These strong yet lightweight polymer microspheres are often used as spacers, fillers, and reference particles for a variety of specialty applications in life sciences, medical technology, MEMS, optics and development of high performance composites. See link for research articles involving our PMMA microspheres. Uncoated poly(methyl methacrylate) or PMMA microspheres and spheres are often used in a wide variety of applications including porous ceramics, self assembled microfluidic devices, biomedical research and life sciences. Silver-coated poly(methyl methacrylate) microspheres, also known as PMMA or acrylic microspheres, are often used to create a soft slightly deformable conductive polymer spacer material.